Everything's Easier By Dealing With A Professional! California Professional Cleaning Service by Squeaky Clean Co.
Our service area includes Malibu, Pacific Palisades, Santa Monica, Brentwood, the West side, San Fernando Valley as well as Beverly Hills, Hancock Park, Hollywood Hills, and Pasadena. We have offered construction cleaning services for over twenty years now! 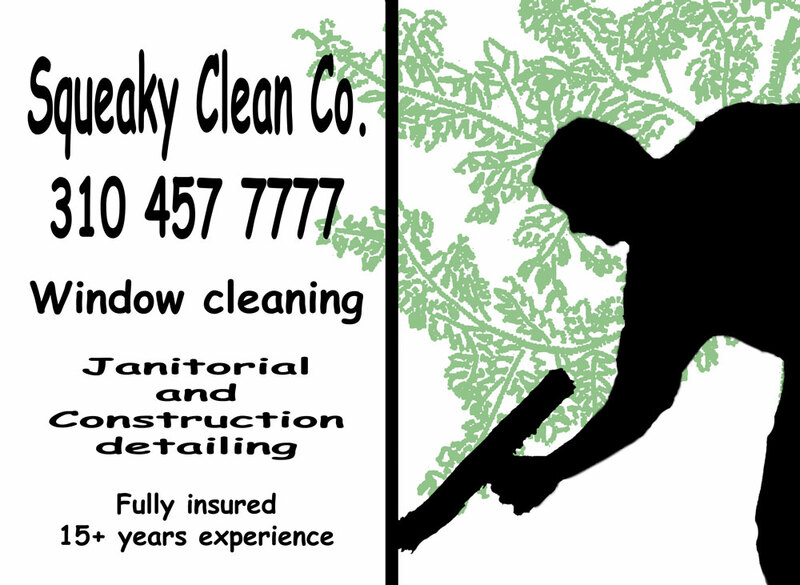 We specialize in post construction clean up as well as window cleaning. Our business is simple, we offer the best quality service at the most competitive prices. We believe that clear communication and great customer service is essential to customer satisfaction. Our personal approach and customized management systems allow us to create a unique blend of professional cleaning services to precisely meet the cleaning needs of our clients. We have developed an organization that provides superior cleaning services by careful training and by managing quality control. We are also committed to quality and a healthy environment. In post construction cleaning, we have three on-site managers/specialist; A lead interior specialist and his workers as well as a window cleaning manager and his technicians. Both working managers report and follow the lead of the Squeaky Clean Job site Manager. Our number one priority is jobsite safety. Our company director, Zeke Torres is a UCLA graduate. He is keenly concerned with the fragile, delicate cleaning requirements of most building materials. Zeke is keenly aware of the great cost in finding, installing and maintaining the modern sophisticated architectural elements in today’s buildings. Time is of the essence and as dear as all related costs… This is the mentality and consciousness that exists throughout our organization. Most of our clients know and use our services based on our record, they also use us because of the bottom line… cost. When you hire us for a final construction clean up, we may clean the project two and sometimes three times. Until you move in the furniture or you deliver the project, There are no additional costs once you hire us.